It has not been the best of days for my husband’s electric car adventures. He spent most of the morning using his 2012 Nissan Leaf as an office because the Blink network of charging stations is down. He learned about the network crash after heading to a Blink DC charger following a dentist appointment. Finding the charger down, he called Blink and was told that entire system is not working. Don’t look for answers on its website because that is down too. A Blink representative told him that they are working on the issue. In response to complaints on Twitter, @blinknetwork responded in the same vein. Car Charging – which now owns Blink after ECOtality, its former owner, hit financial troubles (see related post) -had no mention of the outage on its website. Meanwhile, my husband was happy he had a WiFi hot spot so that he could work while charging his vehicle at a Level 2 charger run by a different company. He finally had enough juice to make it to a nearby university library to finish out the day. But, making it to his office in San Francisco is not going to happen today. It makes me realize how much we have grown to depend on charging stations, especially in the San Francisco Bay Area, where there are quite a few DC chargers. Incidents like this remind us that EV life is far from mainstream. Let’s hope Blink fixes the problem soon and explains what went wrong. 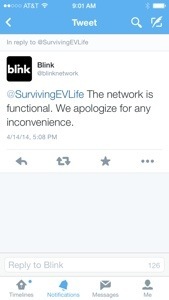 UPDATE: At 5:08 p.m. PT later that Monday, Blink tweeted me and said: ” The network is functional. We apologize for any inconvenience.” I have contacted them in hopes of receiving more information. Did anyone else experience problems due to the Blink crash? Please leave your comments here. Our “EV life” is different. We have a Nissan Leaf and it cannot be our only car. My wife and I both need cars to go to work, so we have two cars, but the Leaf is our primary car, except for trips that exceed its range, which (for us) happen a few times a month. And we are very happy with the Leaf. My favorite way to explain the Leaf is: imagine you have a car that gets refilled nightly at $1 per gallon, but it only holds 3 gallons. You never have to stop for gas, and it has almost no maintenance. Can it work for you if one of your cars were like that? Most other families could do what we do: use an EV for half its transportation. Our EV life can easily become mainstream, and technological advances will only accelerate this process. From an political and economic perspective, I’d really like to see that transportation consume more electricity made in America, and that oil imports are reduced.